With the new option to sync my devices to iCloud instead of my computer, it sounded like a great idea. The problem was, after a couple days of being synced to the “cloud”, all my files in Keynote, Pages & Numbers disappeared on all my devices. I have my iPad, iPhone 4 and iPhone 4S all syncing and it was awesome to watch my files push in to my devices and cross sync between them the first time. When I opened Pages a few days later and all the files vanished. I was not happy. I have a couple major documents on there and I was trying to remember where I might have backed them up. I know I had emailed myself some files just incase something happened but I was having trouble finding them in my email and I know it wasn’t all my files from all devices from all three apps. 1. 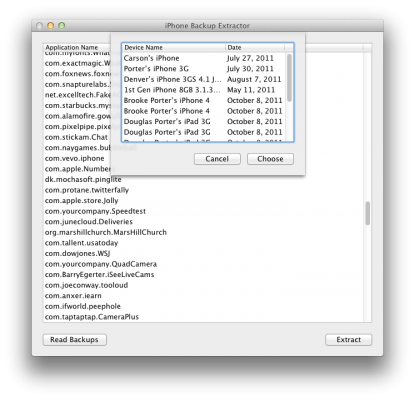 Download the app called iPhone/iPod Touch Backup Extractor found at supercrazyawesome.com. 2. Run the app and click “Read Backups”. 3. Select the backup you want to restore files from and click choose. 4. Find the app you are trying to extract files from. This will work for any app but we’re looking for Pages, Numbers or Keynote. They’ll look like com.apple.Numbers. Highlight it and click Extract. 5. Find that extracted file using Finder. 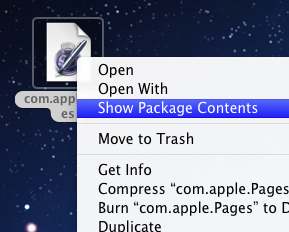 Right click on it and select “Show Package Contents”. This will show you the folders inside the file. Find the Documents folder and your files should be in there! 6. Now we need to send the files back to the cloud. Log into icloud.com and select iWork. 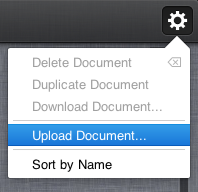 Then, in the top right corner click the little gear and select “Upload Document”. Now just pick your files and upload them and they will push to all your devices logged into that iCloud account! Let me know if this worked for you or if you have another tip on how to restore your lost iCloud files. Is that happening to everyone? I wasn’t even aware that the docs were disappearing. That’s terrible, and is one of the reasons I’m not a cloud believer. This is not a trivial issue. Typically, I am a someone who goes with all the new technology I can get my hands on. But AT&T wouldn’t upgrade me so I have to wait 4 months before I can get my iPhone 4S. Maybe I should thank AT&T. If people start to lose their documents this needs to be corrected with no chance of it ever happening again. I will be sniffing all around to see how big this issue is. Thanks for sharing. This article is really helpful to me. Thanks , I have recently been looking for info approximately this subject for a while and yours is the best I’ve discovered so far. But, what about the conclusion? Are you sure concerning the source? How do I do the last step? When I go to com.apple.Numbers, I don’t have files I can upload. In the documents folder, I have folders 1 through 21. Then in each folder I have files like buildVersionHistory.plist, index.db, Data folder, Preview folder. How am I supposed to upload this to iCloud? Renaming the folder to .numbers doesn’t work. I have 3 files: index.db. a .plist file, and a preview file inside a folder (named by a number). How to upload this to iCloud? Fantastic! Worked like a charm. In my case, I wanted to extract the documents from an iPad no longer in the house–and directly put them on a different device rather than go the iCloud route. As you explained, simply do a control-click (or right-click with the mouse) on the file, and select Show Package Contents. Inside there is a folder Library. It has 3 folders. You want to the top one, Application Support. Inside it is a folder Documents. That contains any previously saved/used documents. Go over to iTunes with your target device connected. In the Apps section in the iTunes window for your i-device, scroll down to the Files Sharing portion. Select Numbers (or Pages) and drag the files onto the iTunes window. Voila! They appear in the window. Then, just sync. Voila! On the other device.